More photos. Click on the photos for high resolution pictures! This dinghy was built around 1900 by Junge-Werft in Wewelsfleet at the banks of Elbe river, Germany. 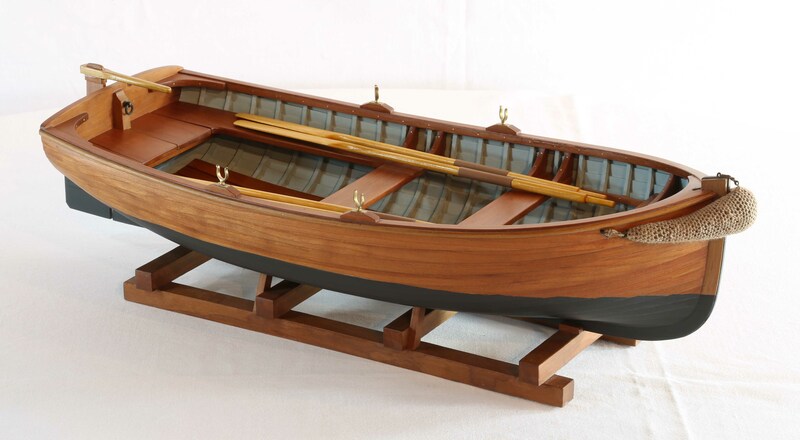 The ship model was built from cherry tree wood according to the plans by the Deutsche Schiffahrtsmuseum (Maritime Museum of Germany) in Bremerhaven. There are more pictures, views of the entire ship model and closer views of details. Click images to enlarge! This model of a dinghy was built by Rainer Wedel, Geestland, Germany. He is model maker at the Deutsches Schiffahrtsmuseum (Maritime Museum of Germany) in Bremerhaven. The boat is a very beautiful, fine piece of work, a true master piece. The model is 1 : 10 scale. Length is 41 cm, width 19 cm, height 14 cm (including stand). The model can be taken out of the stand, e.g. for transport.